frequency distribution in statistics, a mathematical function that describes the distribution of measurements on a scale for a specific population. normal distribution a symmetrical distribution of scores with the majority concentrated around the mean; for example, that representing a large number of independent random events. It is in the shape of a bell-shaped curve. Called also gaussian distribution. See illustration. Normal distribution. 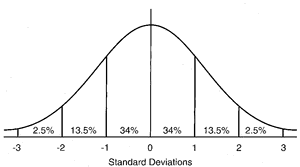 The approximate percentage of the area (or frequency) lying under the curve between standard deviations is indicated. From Dorland's, 2000.
probability distribution a mathematical function that assigns to each measurable event in a sample group the probability that the event will occur. (in statistics) a theoretic distribution frequency of variable data usually represented graphically by a bell-shaped curve that reaches a peak about the mean. A bell-shaped frequency distribution of data, the plotted curve of which is symmetrical about the mean, indicating no significant deviation of the data set from the mean. Continuous and symmetrical, with both tails extending to infinity; arithmetic mean, mode, and median are identical. The curve’s shape is completely determined by the mean and standard deviation. The statistical distribution of members of a population around the population mean. In a gaussian distribution, 68.2% of values fall within ± 1 standard deviation (SD); 95.4% fall within ± 2 SD of the mean; and 99.7% fall within ± 3 SD of the mean. Synonym(s): bell-shaped curve, normal distribution. Gaussian distribution, a distribution which when expressed graphically is bell-shaped. The distribution to which many frequency distributions of biological variables, such as height, weight, intelligence, etc correspond. Johann K.F., German physicist, 1777-1855.
gauss - a unit of magnetic field intensity. Specific bell-shaped frequency distribution commonly assumed by statisticians to represent the infinite population of measurements from which a sample has been drawn. 1. agreeing with the regular and established type. When said of a solution, it denotes one containing one chemical equivalent of solute per liter of solution; e.g. a 0.5 normal (0.5 N) solution has a concentration of 0.5 Eq/l. The use of standard units (Eq/l) is now generally preferred in pharmacy and clinical medicine although elsewhere molarity (M) is used. 2. in the context of infectious diseases, not immunized or infected. 3. statistically speaking, the values of a variable which follow a bell-shaped or Gaussian distribution. limits of the classification of 'normal' in the results of a test. contains 0.9% sodium chloride. Called also isotonic saline.